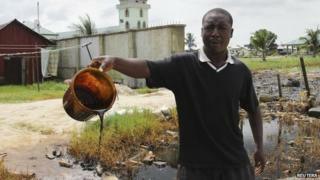 Oil giant Shell is being sued in London for the second time in five years over spills in the Niger Delta. Two communities are claiming compensation and want Shell to clean up their land. Shell said it is at an "early stage" in reviewing the claims and that the case should be heard in Nigeria. The Ogale community of about 40,000 people in Rivers State, on the coast of Nigeria, who are mainly farmers or fishermen, are some of the claimants. Their case is being handled by law firm Leigh Day. Spills since 1989 have meant they don't have clean drinking water, farmland or rivers, their claim says. It points to a November 2015 report by Amnesty International which says four spill sites Shell says it planned to clean up are still contaminated. The first court hearing at the Technology and Construction Court, held on Wednesday, found that the claimants can can lodge a case against Shell's Nigerian business, known as Shell Petroleum Development Company of Nigeria (SPDC). Shell declined to comment on the ruling. Amnesty's findings followed a 2011 report by United Nations Environment Programme (UNEP) which found water contaminated with oil by-products including benzene, thought to be a carcinogen. It suggested a clean up, but said a "sustainable recovery" of the area could take up to 30 years. Shell says it has agreed a clean-up plan. "In mid-2015 SPDC JV, along with the government, UNEP and representatives of the Ogoni community, agreed to an 18-month roadmap to fast-track the environmental clean-up and remediation of Ogoniland which includes a governance framework," it said in a statement. The Bille community, who are mainly fishermen and are the other party to sue, claims Shell should be liable for "failing to protect their pipelines from damage caused by third parties", according to Leigh Day. Pipelines in the area have been targets for thieves who steal crude oil and try to refine it locally. This has lead to more spills and damage though explosions. "Both Bille and Ogale are areas heavily impacted by crude oil theft, pipeline sabotage and illegal refining which remain the main sources of pollution across the Niger Delta. "Ogale is in Ogoniland and it is important to note that SPDC has produced no oil or gas in Ogoniland since 1993. Access to the area has been limited following a rise in violence, threats to staff and attacks on facilities," Shell said. But the communities say Shell pipelines lack the technology to detect and shut off leaks, whatever the cause. Daniel Leader, partner at Leigh Day said: "It is scandalous that four years after the UNEP Report Shell is yet to clean up its oil in either Ogale or Bille. Our client's patience has now run out and we intend to force Shell to act since it is clear they have no intention of doing so on their own." In January last year, Shell agreed to an $84m (£55m) settlement with residents of the Bodo community in the Niger Delta for two oil spills. The same law firm, Leigh Day, said their 15,600 clients would receive $3,300 each for losses caused by the spills. The remaining $30m would be left for the community, which Leigh Day said was "devastated by the two massive oil spills in 2008 and 2009". That dispute began in 2011. During the trial emails, letters and internal reports submitted to a court in London, and seen by the BBC, showed that senior Shell employees were concerned before the spill that Shell's pipelines in the area had reached the end of their lives and needed replacing to avoid danger to lives, the environment and the economy. Two spills in 2008 affected about 35 sq miles (90 sq km) in southern Nigeria, according to the Bodo community which sued Shell. Shell said at the time it "dismisses the suggestion that it has knowingly continued to use a pipeline that is not safe to operate".